Vancouver, BC – The new ‘Percy Jackson & The Olympians: The Lightning Theif” opened on Friday the 12th of February. It is a movie based on Greek Mythology that follows Percy [Logan Lerman], a teenager that discovers he is a descendant of a Greek god who must find the thief who stole Zeus’ lightning bolt. The star-studded film includes such A-list actors as Pierce Brosnan, Alexandra Daddario, Sean Bean, Steve Coogan, Rosario Dawson, and Uma Thurman. 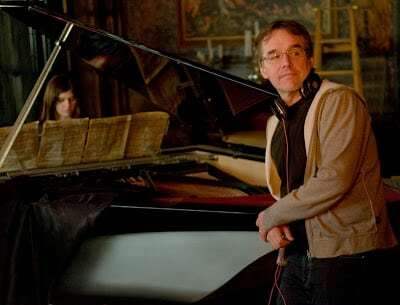 In the movie, when Percy visits the mansion of the character played by Steve Coogan, a Fazioli M. Liminal grand piano can be seen during the scenes in the main room. Vancouver’s Showcase Pianos had loaned the piano to the set, which is one of only eight in the world. The piano’s stunning design is credited to Philippe Gendre of NYT Line in France. Store owner Manuel Bernaschek was invited to tour the impressive set in Burnaby where a mansion was recreated inside a warehouse, together with a stunning recreation of an entire section of the Metropolitan Museum of Art. Showcase Pianos Fazioli was invited to the pre-screening of the movie before its official release on Friday the 12th of February, 2010, which coincided with the opening day of the Olympics. Although the script didn’t call for any piano playing, the production stills show that the actors enjoyed taking the Fazioli for a test-drive at least for a few moments between filming.